Carrie S. Forbes - Gingerlemongirl.com: Book Giveaway: I'm a Celiac's "Gluten Free Family Approved Recipes"
Book Giveaway: I'm a Celiac's "Gluten Free Family Approved Recipes"
Enchilada Casserole page 50, from Pam Jordan's "Gluten Free Family Approved Recipes"
I am a simple cook. I love shows like "Chopped" and "Cupcake Wars" and "Masterchef"... but honestly I'd never want to compete in them. Because my cooking isn't gourmet, it isn't fancy, it's just good food for hungry bellies. Every single recipe has been shared and enjoyed at her family table with three hungry kids and her husband. "One Dish Wonder" pg. 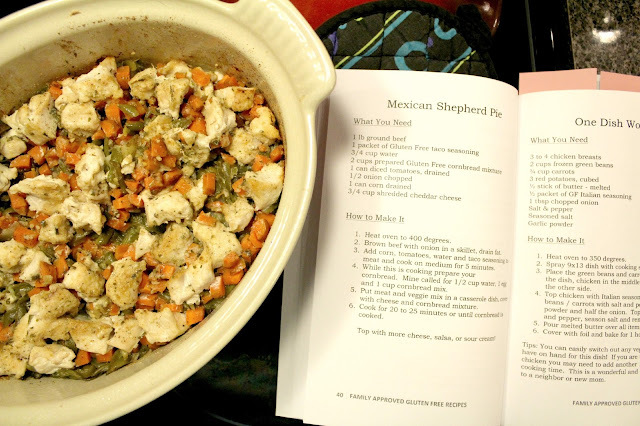 41 from Pan Jordan's "Gluten Free Family Approved Recipes"
So far I've tried the "One Dish Wonder" on page 41, a really awesome chicken meal that shows you how to make the main dish + 2 sides in one casserole dish. I loved this meal. Pam shows you how to cook all three parts of the meal in one dish by making them side by side with different seasonings. I actually just layered the dish because I was short on chicken. But the flavors in this meal are spot on! Pam called for GF Italian dressing seasoning, but I didn't have any... so I used half a package of dry Ranch dressing mix instead and it was AWESOME! I can't believe I've never thought to use the flavors of a dressing mix in a casserole. We loved this! We also tried the Enchilada Casserole on page 50 (see the top picture in this post). 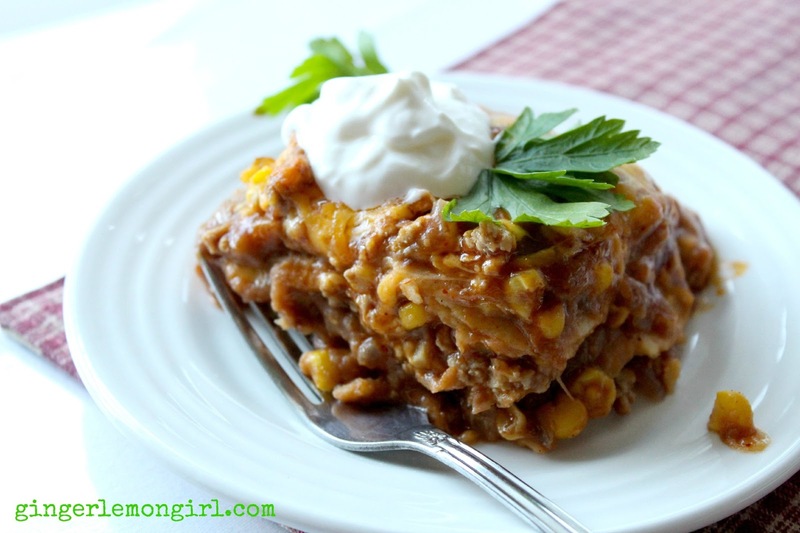 It uses jarred gluten-free enchilada sauce (I had never used it before! YUM! ), corn tortillas, and ground beef (we used ground turkey since that's what I had on hand). This was a really good casserole. Michael said it was like a "Mexican" lasagna and that's what I thought too. We will definitely be making this again. Pam's book is a real bargain. As a matter of fact, you can buy it for your kindle right now for only $3.99 from Amazon. A STEAL for an entire book of tested recipes that really work the first time you try them! The next recipe on my list to try is the Pear Cobbler. Pears are my favorite fruit and I've never thought to try them in a cobbler, so I know that will be absolutely delicious! Would you like to win a print copy of Pam's awesome book? 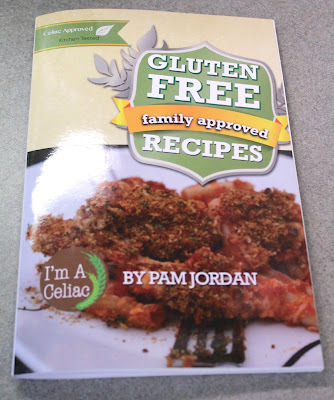 1 brand new printed copy of Pam Jordan's cookbook, "Gluten Free Family Approved Recipes"
The giveaway begins July 25, 2013 and ends on July 29, 2013 at 11:00 pm eastern daylight savings time. Pam sent me a free printed copy of her book to review, if I chose to do so. This is not a sponsored post and I did not receive monetary compensation. The opinions in this post are completely my own. The giveaway copy of the printed book will be provided by Pam Jordan. OMG! Those pictures look so yummy. I'm always looking for good stick-to-your ribs recipes that are fast to put together and easy to boot. Thanks for all of the reviews. I have collected many cookbooks based on your reviews. You are a life saver or is it savor? :) drams1967(at)gmail(dot)com. I would really like some good recipes like this to try. She is so down to earth and just "real!" I had the pleasure of meeting her briefly in Chicago a few months ago -- great to see a cookbook that is family friendly and as down to earth as she is! This looks like a great cookbook for me right now. I've just recently had a baby and now have 4 kids under 8 and I need quick simple kid friendly meals that everyone will enjoy and are gluten free. I would definnately put this cookbook to good use! Thanks for the giveaway! Recently thought to have hypothyroidism so am now gluten free - would be so blessed with these recipes. tholgate@windstream.net. Thank you for the opportunity!